Fashion Baby Diaper Nappy Mummy Bag Maternity Organizer Changing Bottle Holder Stroller Women's Handbags for Mom Large capacity, one bag could solve all the child's items, easy convenient use, take your baby, let's feel the beauty of the outside world together! 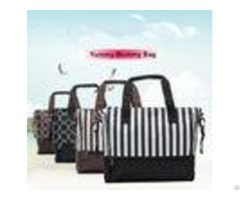 Light, environmentally friendly, large capacity, multi-functional PRODUCT INFORMATION Product Name: Multi-function Mummy bag Product size: about 270 mm * 210 mm * 420 mm Color classification: Dot Coffee and Black/ Stripe Coffee and Black Surface Fabric: Polyester Ingredients: Polyester Hardware pendant: rust-proof glaze hanging plating Why choose this mummy bag? 1. Large capacity Large capacity multi-functional inner bag Mummy bag all items, could be easily packed in one Pocket. Pick up and take out things from bag safety, without worry 2. Multi-function There are six split bags inside the bag Different items placed separately, more reasonable 3. Can hang on the carts Have given two baby carriage buckles, can hang on the child carts, easy travel. 4. Machine washable Oxford cloth material, support machine washing, could not be deformed, so mum could have more time to take care of the baby Features: NO.1: ultra-light design 0.68KG NO.2: large capacity, multi-compartment interior design, reasonable separation of space NO.3: multi-functional, bags can be hang on stroller, portable, shoulder diagonal, to meet the different needs of mum. NO.4: the bottom has a pocket, intimate bottom pocket, can put used things like umbrellas etc., a variety of purposes NO.5: back pocket, anti-theft design, travel safety no worries PRODUCT SHOW: Packing& Shipping - - - - Sample | Lead time 1-3days, For first cooperation, need to charge sample fee | Lead time | 1-3 days for stocks; 30-35 business days for OEM order after sample is confirmed, depend on the quantity. | Port | Shenzhen, Guangzhou | Payment | T/T, PayPal, Western union | - - - - About us: META Bag Factory Co., Ltd. is located in Shenzhen, China. We are professional in Bags supplies, Nowadays we have nearly 2, 000 square meters workshop. We produce Various kinds of Backpack, Travel Bag, Laptop bag, Shoulder bag, Hand bag, Cosmetic bag, Tool bags etc., and most of those bags are with plenty stocks for your choosing. We also Accept OEM order, sample is available and delivery time is very fast because we are very close to the fabrics Market, so the efficiency is guranteed and it is also an advantage for the price. Welcome to consult us!